Key difference: The major difference between soybean and palm oil is the ways in which they are obtained from their origins i.e. Soybean oil is extracted from the soybean seeds, and Palm oil is extracted from the mesocarp, which is a reddish pulp of the oil palm fruit. Every healthy diet should contain small amount of fats; and as oils are basic rich sources of fats they are preferred according to the health benefits. The edible oils and fats obtained from plant sources are most essential ingredients in the dietary foods. Nowadays, oils have great commercial applications in the cosmetic and beauty industries. Soybean and Palm oils are most preferred and cheap available type of oils. Both, oils are a part of vast range of vegetable oils, with their respective qualities and health benefits. Soybean oil has gain lots of importance during the last few years, due to its protein rich and health effective qualities. The oil is obtained by long processes, in which the soybean seeds are cracked, adjusted for moisture content, heated to between 60 and 88 ºC (140–190 °F), rolled into flakes, and finally tretaed with solvent-extracted with hexanes; sometimes the oil is also hydrogenated. It is rich in oxidation-prone linolenic acid; poly- and monounsaturated fats. From the traditional times, the oil is used in shortening purposes in old-fashioned pie crust, blended with flavored vinegar for a new dressing. The oil has an extra qualitative nature of adjusting the flavor with that of the respective food item. It has an imperceptible odor support which enhances the natural flavors of prepared foods. It is frequently used in mayonnaise, salad dressings, frozen foods, imitation dairy and meat products and commercially baked goods. 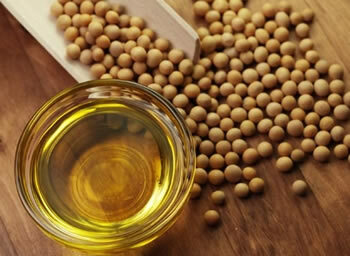 Soybean oil is processed to form drying oil, which is further used in the applications of printing inks (soy ink) and oil paints. Palm oil is regarded to be the cheapest of all oils, due to its easy availability and extraction process. The oil is obtained from the pulp of the palm oil fruits. An appropriate and convenient process is carried out in order to obtain the oil, generally the basic level heating is carried out at high temperature, which further yields to the crude oil production, then refined and the commercial palm oil is obtained. The oil palm yields two types of oil: One is extracted from the flesh of the fruit (palm oil), and the other from the seed, or kernel (palm kernel oil). Today, the palm oil is one among the common cooking ingredients in the tropical belt of Africa, Southeast Asia and parts of Brazil. The oil is rich in fats and hence is used as a source of biodiesel (as palm oil methyl ester). Palm oil is composed of fatty acids and esterified with glycerol like all fat. Unlike all fats, the oil contains high concentration of saturated fatty acids, which are solid at room temperature. Due to the recent development in food sectors, the oil is used as a substitute for butter. Though soybean and palm oil have considerable same amount of calories; they differ in their essential vitamins and heart-healthy fatty acid components. Both soybean and palm oils contains fat-soluble vitamin E, which acts as an anti-oxidant in order to protect the cells , along with this, it also protects the fatty acids as they might get damaged due to the free-radicals. Also, both oils have vitamin k in common, which proves to be essential for blood clotting. The major factor in which these oils differ, is their health related issues, i.e. soybean oil is more beneficial and health conscious than that of palm oil, as over consumption of palm oils may give rise to hyper obesity and other health related issues. Costlier as compared to palm oil.